Three Humboldt State University faculty members— History Professor Leena Dallasheh, Business Professor Tyler Stumpf, and Psychology Professor Amber Gaffney—have been selected as recipients of the 2017 McCrone Promising Faculty Scholars Award. Selected for exhibiting potential in a specific field, each faculty member will receive $1,500 to assist a program of creative activity, scholarship, or research. This year’s recipients will be formally honored at a reception where they’ll deliver short presentations of their research. In addition, graduate student Yojana Miraya Oscco has been selected as this year’s recipient of the McCrone Graduate Fellowship Award. The award is given to graduate students who have demonstrated strong potential in their field. An excellent mentor and teacher in three departments— History, Geography, and Politics—Professor Leena Dallasheh has worked on campus and in the local community to promote understanding of the historical and contemporary challenges in the Middle East. Her efforts include numerous speeches and interviews, a film seminar, and a long list of scholarly articles in notable academic journals. 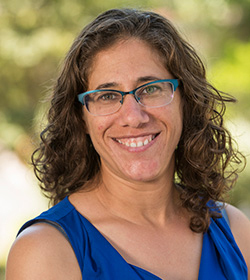 The Stanford University Press is considering publishing her book manuscript, Red Nazareth: Palestinians and the Transition from British Mandate to Israel, which is a study of citizenship and state-minority relations in the national and international contexts of the creation of the state of Israel in the mid-20th Century. Dallasheh’s record includes speaking at events in the US and abroad, most recently at Cornell University, as well as outreach to broad audiences through a variety of news media. In his short time at HSU, School of Business Professor Tyler Stumpf has garnered an impressive number of research and teaching accomplishments. His work focuses on applied tourism and service business management, and utilizes sophisticated methods that have important practical and theoretical implications. Stemming from a Peace Corps experience in the early 2000s, much of Stumpf’s research focuses on sustainable tourism in developing Pacific island nations. 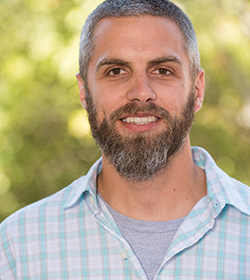 The findings of his studies have implications that can extend to Humboldt County and other parts of the world, and they allow him to bring international perspectives into the classroom that integrate economic, social, and environmental considerations. 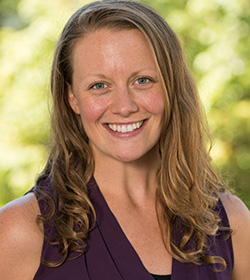 Psychology Professor Amber Gaffney’s work in social psychology has appeared in volumes in major publications and she has presented at top conferences in her field. In a short time at HSU, she’s developed a bustling lab, which includes around 20 undergraduate and graduate research assistants. Over the last two years, her work has focused on the current climate of political uncertainty and extremism, minority influence, protest, and how candidates can focus on social identity rhetoric to gain support. Her recent work has taken her and some of her research assistants to political conventions to examine changes in political identity as a result of cultural shifts as well as political protest. Amber received her BA in Psychology from HSU and her PhD in Social Psychology from Claremont Graduate University and her international reputation continues to grow as she publishes and presents her work internationally. This year’s recipient of the Alistair & Judith McCrone Graduate Fellowship Award is Yojana Miraya Oscco, who is pursuing a master’s degree in Environment and Community. Miraya Oscco has been selected for demonstrating potential to succeed in her chosen field, and will have $3,000 applied to her tuition for the upcoming academic year. Miraya Oscco is an accomplished scholar in HSU’s Environment and Community Masters of Arts in Social Science graduate program. Originally from a remote village in the Peruvian Andes, she earned her undergraduate degree in Geographical Sciences at the National Superior University of San Marcos before coming to Humboldt State, where she immediately distinguished herself. 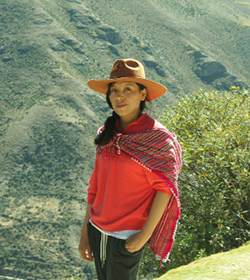 She is fluent in her native Quechua and Spanish, which will enable her to conduct research in the language of these communities. Miraya Ossco’s research focuses on the socio-political and ecological impacts of expanding large-scale mining in her ancestral Quechua communities. Her unique research examines facets of environmental and agricultural politics specifically focusing on indigenous political organization, its functions, and its effects on local, regional, and national mining environmental politics and development. Finally, she will expand on the challenges and opportunities the indigenous communities in the Andes face while organizing politically. Her cultural and linguistic fluency and commitment to social justice make her a natural fit for the McCrone award. She will conduct field research in Peru during the summer of 2017, the costs of which will be aided by the award. The accomplishments of the McCrone Promising Faculty Scholars Award winning professors will be celebrated at a reception at 4 p.m. on Weds., April 19 in the Great Hall. They will present short presentations about their research.